Named after a famous Icelandic volcano, the Katla’s design was inspired by AEV’s popular Savegre wheel for the JK Wrangler, but adapted for use on 3/4 and 1-ton Ram trucks. This proven design not only looks great, but is also capable of withstanding extremely heavy loads. AEV’s signature recessed valve stems provide added protection from rocks and other objects on the trail. The 17×8.5 Katla features a Ram-specific backspacing that is designed for the perfect fitment with or without factory fender flares when using up to a 37” tire. 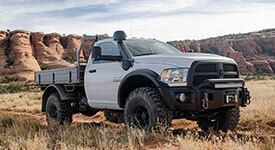 The 17×10 fitment is designed for customers who are using AEV’s HighMark Fender Flares with 40″ tires installed. The Katla’s vehicle specific wheel design provides the optimal balance of tire clearance, scrub radius and handling for your truck. Available in Onyx and a paintable, satin Black finish.